Tooling is needed for any plastics molding process, but the tooling for rotomolding is generally less of an advance capital expense in comparison to other plastics manufacturing processes. When a design for a rotomolded product is finished, the process of turning that layout into a mold to run begins. 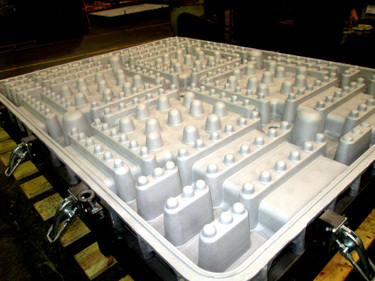 Molds or tooling for the rotomolding process are often fabricated from steel or aluminum, possibly machined or cast from aluminum. Producing molds for rotational molding is a specialty, that requires expertise of those experienced with the process and have deep understanding of the requirements of rotomolding design. The quality of the tooling produced will have a direct impact on the quality of the parts being produced so the experience, precision and expertise of the moldmakerneed to be thought about. Molds for rotomolding can be fabricated to create single wall parts, double wall parts or to produce multiple parts at the same time. Some product designs may need to be modified in order to produce tooling to manufacture parts as efficiently as possible. Sharp edges, large flat surfaces or transitions from one area to another may be elements that need to be modified. This is why it is important to work with a rotational molding company who can assist in the rotomolding design. Today's leading rotomolding companies are offering in-house mold and tooling services as well as the ability to repair rotomolding tools in effort to keep clients production going. The in-house tooling and metals capabilities allow these rotational molding leaders to keep their customers' tooling in production, while being able to provide brand-new customers with new tooling. Unfortunately, a number of Rotational Molding firms do not provide mold and tooling maintenance, nor do they build molds or tooling for the rotational molding process. Thus when the molds or tooling begins to crack, framework work breaks or the parting lines become damaged, the molds will be required to be pulled out of production, potentially delaying the project for weeks or even months!